Free Money Review – Is There Such a Thing as Free Money? Does the Free Money Really Work? 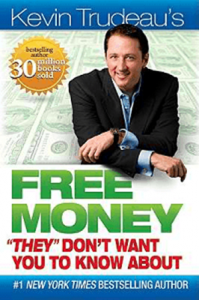 This is a book written by a well known author, Kevin Trudeau. It is supposed to give you ways to source out free money through all different government and private resources. Is there really such a thing as Free Money? This 256 page book outlines that there is supposedly tons of free money available for the asking that will help to pay your bills, food costs, childcare, mortgage payments and more. This is money that is apparently available through Government grants and entitlements and even private programs. Kevin Trudeau promotes this book through various marketing medias. He claims that if after buying this book that if you don’t see at least $500. coming in as a result of it then you will get a refund on the book. His media material claims that this is a way to get fast cash that you never have to pay back. The hype for this book all centers around the well known fact that anyone would be interested in getting free money. There are plenty of false promises for this on the internet so a book like Free Money can glean off of the hype that already exists, then its a matter of fueling it with the appropriate bonuses that make it look even sweeter. To achieve this along with your purchase of this book you also get several bonuses like Debt Cures II, 25 Ways to 5K, Free Stuff Audio CD, all of which have been produced by Kevin. The promise of seeing at least $500. in cash is the grand booster for the Free Money book. Making money opportunities have been promoted for years, and for the most part the saying that “if it sounds too good to be true”,then it probably is. For more information check out Do Money Making Programs Really Work. By the time you add in the shipping & handling costs for the book itself and the same for the bonuses you end up paying $44. Our research has shown us that you can buy the same book on Amazon for $10.38 in hard cover,but free shipping is only available on orders over $25. Plus, these are advertised as bargain books which means there is limited quantity and they may be slightly marked. You also aren’t getting the bonus items with the Amazon purchase. First you are going to need to have plenty of time for reading. This is a large book then when you factor in all of the reading time its going to take to cover the content in the bonuses you are looking at a big time commitment. It doesn’t end there though as you would then have to implement all of the instructions that are sure to be present for tapping into the money making resources. Anything that promotes free money really has to be reviewed with skepticism, and in this case this approach seems to be the best one. Analyzing the many comments from those that have read the book shows that many were totally disappointed with it. It seems that the content doesn’t present much by way of being anything new, that it is redundant and full of hype. For those that have become wise to this type of adventure they don’t find this surprising. A Thumbs Down rating is what we have awarded to this product. The reasons for such a negative rating is based on the amount of hype that is being produced about the Book as opposed to any real value of what the content could possess. Our experience in doing reviews as shown us that there are many different types of products that have been produced over the years based on supposedly “free hidden government money”. Many of the Government grants and entitlements can easily be resourced by an interested party both online and off. Then when you add all of the negative comments and opinions affiliated with buyers of this book, it gives sound grounds for giving the book a thumbs down rating. A similar product that may be a good starter for those that are really interested in what potential grant money may be available to them could be, The Complete Guide to Getting a Grant, by Laurie Blum, available on Amazon. Keep in mind however, while the ratings seem to be good there are only a small amount of them as yet. What do you think? Does Free Money work or not? Does Commission Junction Really Work? Does Inbox Dollars Really Work? Does Pampered Chef Really Work? An update for anyone reading this now, Amazon’s minimum purchase for free shipping has been bumped up from $25 to $35! Not everything qualifies for it either and actually it seems like less and less is qualifying for it. As for this book, if it sounds too good to be true then it’s probably not true! If this book were helping that many people recieve free money then people all over the internet would be bragging and writing testimonials. With the modern day technology that we have its very easy to share information and it be shared by the people you shared it with. A simple Facebook post could lead to hundreds of thousands of people seeing it. If this book were legit there would be thousands of people sharing their wonderful experience. It’s pretty cut and dry. If someone was getting $500 or more just because they bought this book and found an opportunity to find lost money they would be sharing it.